Anyone who knows me well enough will know that I have a love of Disney films. 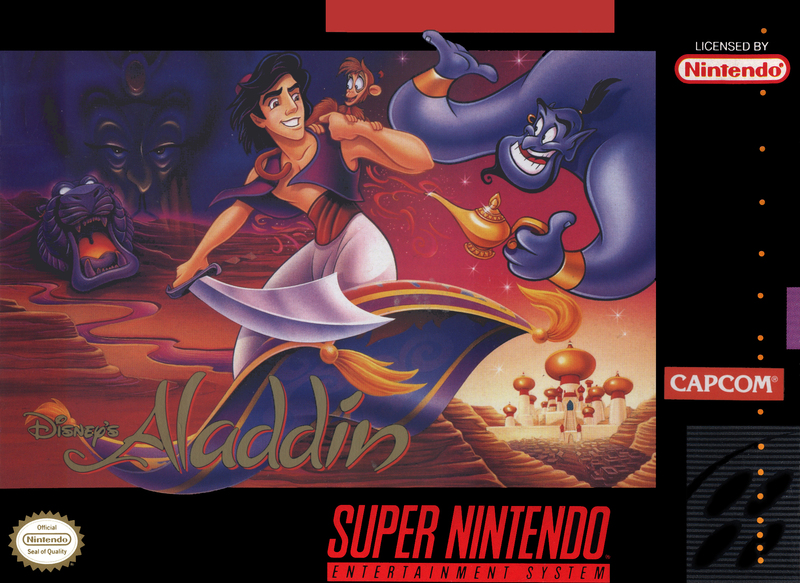 Aladdin has been my favourite ever since it's theatrical release in 1993, and you can imagine my delight at receiving this as my first ever personally owned SNES game at 6 years old (the rest were my Dad's at this time). Developed and published by Capcom, this Super Nintendo version is completely different from Sega Genesis version released at the same time. Whilst the Genesis version focuses on combat swordplay, the SNES version is much more focused on typical platforming elements. Fighting a string of guards with a scimitar has been avoided here. Instead, players can collect apples to throw at guards, and repeatedly jump on their heads to defeat them. The game closely follows the events and settings seen in the Disney film, but like most game adaptations, the occasional change has been adopted to the story, in order to flesh out the game with more levels. 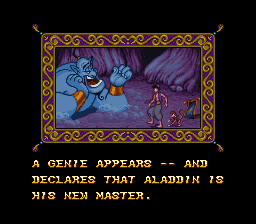 In Aladdin, this is a welcome addition, as the non-familiar levels (such as the surreal world which acts as the Genie's "Friend Like Me" segment in the film) are incredibly fun. 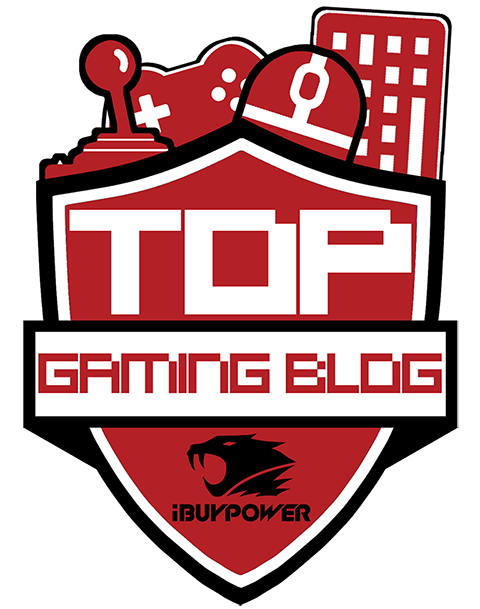 Occasionally, the jumping is a little tricky to master, and the Genie's level will cause some temporary frustration while you get to grips with it, but in general, the game play offered by Capcom is solid. One great addition to the game was the bonus mini-games that could be unlocked at times. 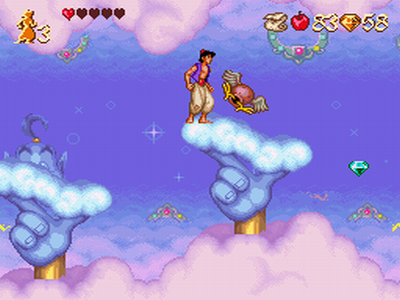 If the player manages to catch a golden scarab, or collect all the diamonds on a particular stage, they will be transported to a mini-game involving the Genie and a wheel. Spin the wheel and you will be granted whatever it falls on (eg. an extra life, more apples, etc). Sometimes the title screen will change depending on how much you have collected throughout the levels. The boss battles are well thought out, with the final battle against Jafar (especially the section with him in his snake form) is well animated, and makes for riveting play. The sound is also worth noting. Capcom have faithfully re-created two of the songs from the film- A Friend Like Me and A Whole New World, as well as adding in a 16-bit score that fits well with the feel of the film. Unfortunately like most games, Aladdin does carry a few flaws, but thankfully these are small. Firstly, the game is very short, and can be completed in a few hours. Whilst this is not necessarily a bad thing, I've completed this game several times now and still yearn for more at the end of it. Another problem I had is that the game can be incredibly challenging and unforgiving at times. Even on the easiest difficulty, the game still has it's sticking moments. But what are these moments exactly? Well, it all boils down to the jumping. I do like a bit of a challenge at times, but not timing a jump correctly once again does get a little frustrating. Many jump sequences can be avoided by finding and using the parachute. Sadly if you mess up, the parachute does not appear again when you re-spawn after death though, which leaves you struggling to cover sections which are perfect for hovering over with a parachute. Overall, Capcom have really managed to capture the spirit of Disney's excellent Aladdin, the graphics definitely look well-polished for it's time, and the game play on offer is incredibly fun. It's unfortunate that the game can be way too difficult at times, but there is enough on offer here to continue playing the game. As for a simple way of summing up Aladdin? Short, but definitely sweet. I friggin' loved Aladdin! I played the hell out of that game! It really was a surprisingly good game - could've been a lot worse, you know? Like most retro games, the difficulty definitely stands out when you compare it to today's titles. Ah I loved the Aladdin games, I fear if I played them now I would probably quit half way through as we have life much easier these days with unlimited continues and extra health etc.